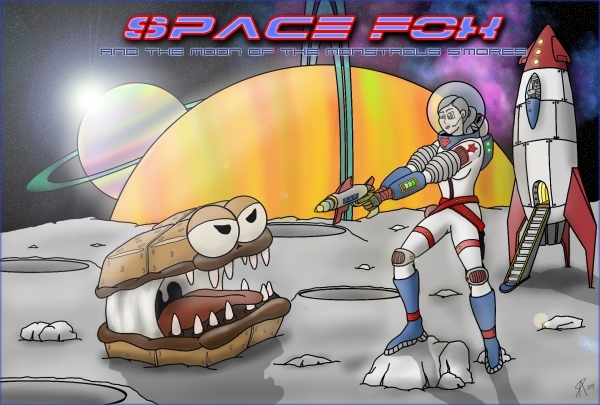 Space Fox: And the Moon of the Monstrous S’mores! Yeah, so this one requires a short bit of explanation. So a few days ago I was doodling some 1950’s styled pulp sci-fi rocketships. It was purely experimental, you see—me just having some fun drawing something that didn’t have a deadline or didn’t need to convey a story. When I do this, I keep Twitter around for company while also having some television on in the background. In essence, I just try to immerse myself in bits of inspiration. It just so happened that Futurama was on at this moment, so it helped me maintain the retro design style. Albeit, it kind of heavily influenced my sketches towards the cartoony. It was around this time I noticed a Twitter friend’s tweet (it was @omgitsafox, previously mentioned in her birthday post earlier this month). She said something about “zapping some s’mores.” Now, my logical mind assumes she meant she had them in the microwave. But my creative mind, due to the over saturation of rocketships and silliness, decided to conjure an image in my head.